Do you want to camp more often but feel sick of setting up a tent? Not ready to pony up big bucks for an RV? Pop up campers are a great middle ground between tent camping and full-on RVing. The best pop up campers are lightweight, portable, and easy to tow with a mid-size car, minivan or SUV. They fit neatly into a garage or driveway. Their canvas walls give you the feeling of sleeping under the stars, but with more amenities of home. Most pop up campers have beds, kitchens, and sitting areas. Some even have toilets and showers! Pop up campers can sleep up to six people depending on the model, and are much more affordable than a travel trailer or fifth wheel. While pop up campers do have a lot of benefits and are great for first-time RVers, they also have drawbacks as well. 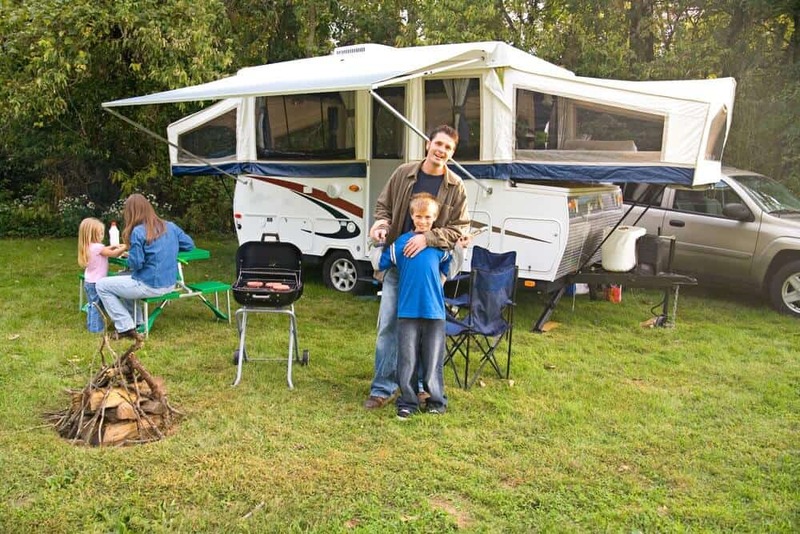 We’ll walk you through the positives and negatives of pop up camper trailers so you can decide if they are the right fit for your family. What exactly is a pop up camper? You’ve probably seen pop up campers when you’re driving down the highway. They are flat and wide, and usually towed by smaller vehicles. Minivans and SUV’s can tow these campers! Pop up campers don’t actually “pop up” when you arrive at your campsite. To set up your tent camper, you’ll use a winch or a hydraulic lift to raise the hard roof, which extends with telescoping metal poles. Then, you pull out the two bed slides by hand. Keep in mind that putting up your pop up camper in pouring rain or gusty wind will not be fun at all. You might have to wait until a calmer time to set up your camper. 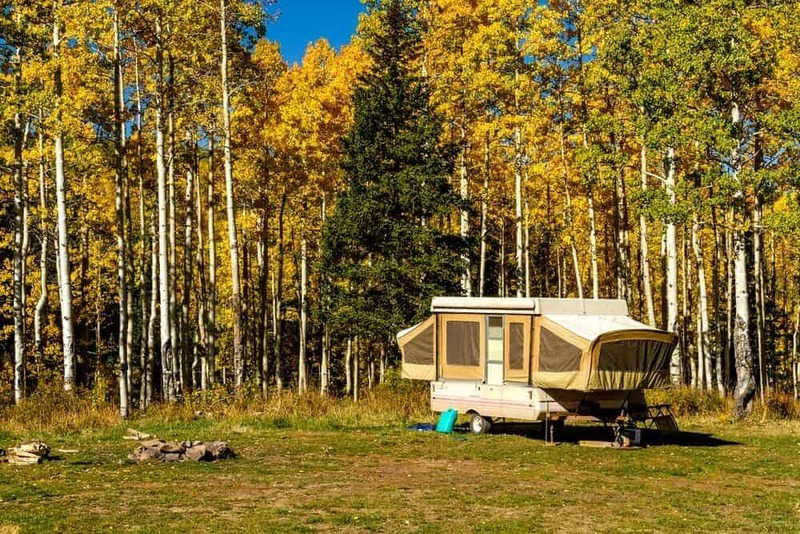 The walls of pop up camper trailers are made out of canvas or vinyl with screened windows, so you’ll be more exposed to the elements than a traditional hard-sided RV. This gives a pop up camper the feeling of being in a tent. You won’t be as far removed from nature and sounds as you would in an RV. Like any outdoor toy, pop up campers have both positives and negatives. You’ll have to weigh each to see if a pop up camper is right for your family. Many people who use these campers swear by them, where others would rather have a campervan, RV or travel trailer. Here are the positives of why you might consider purchasing a pop up camper. 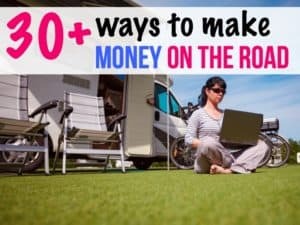 Pop up travel trailers are the most affordable RV out there, hands down. You can get a used pop up camper for $1,000-$2,000 or buy a new one for anywhere between $4,000-$20,000. The amount you spend on a tent trailer is entirely up to you, as there are so much variety and options out there. Another aspect of affordability is the gas mileage. Since folding campers are so light and thin, they won’t create as much drag with towing. You won’t notice much of a difference in your car’s gas mileage when you’re towing a pop up camper. 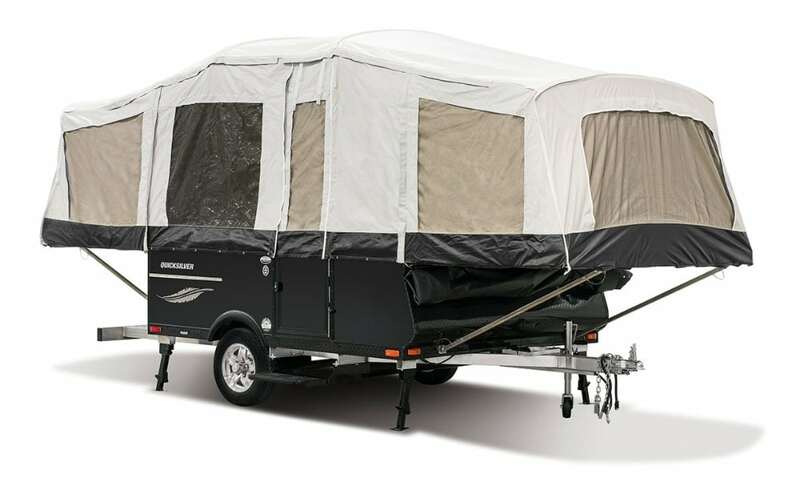 Pop up campers are very light, between 800 and 2,000 pounds. Compare that to the 5,000-pound weight of a typical travel trailer! Some can even be towed by mid-sized cars! You won’t have to buy a hefty pickup truck like you would with a travel trailer or fifth wheel. Many people tow their pop up tent campers with minivans or SUVs. Their folding size makes them very easy to tow and store. They are also higher clearance than some travel trailers and fifth wheels and are easier to take off-grid. Some people hesitate to buy an RV because they don’t want to be removed from nature. How many times have you heard that people in RVs aren’t really camping? Pop up campers are the best of both worlds. They’re part camper, part tent. The canvas walls and screen windows will make you really feel like you’re in nature. You’ll be able to hear the birds in the trees when you wake up and the coyotes when you fall asleep. If you’re used to sleeping in a tent, a pop up camper will feel like pure luxury. You’ll have a stove, refrigerator and counter space. Some pop up campers even come with small bathrooms. There are so many add-ons you can get with a pop up camper, like a WiFi extender, hot water heater and outdoor shower. Instead of setting up multiple tents in one campsite, a pop up camper might be able to fit everyone! Some pop up trailers can fit up to six people. This means less set up and tear down overall. Many of the things that make pop up campers a top pick for some are absolute dealbreakers for other people. For one, pop up campers aren’t meant for heavy use. They’re made out of lightweight material which can rip or get worn out with frequent use. Pop up campers are best for people who do weekend camping a few times every summer. Here are some of the main downsides of going with a pop up camper. Zero insulation in your camper means you can hear everything. I mean everything. This can be lovely sounds like birds, the wind rustling in the trees, or a babbling brook. But it can also mean annoying sounds like your neighbor’s generator, or even your own generator. Every sound in the campground will come zooming into your pop up camper, for better or for worse. As we talked about before, pop up campers have no insulation. That doesn’t only affect the sounds you hear inside the camper, but your rig’s susceptibility to temperatures. Pop up campers don’t come with air conditioning or heating, so if you want those amenities, you’ll have to buy small, portable AC units and heaters. That means you’ll need to run a generator to keep them powered. Some previous owner’s of pop up campers complain that the campers leak. Pop up campers aren’t meant to withstand driving rains or blustery winds like a hard-sided travel trailer or RV. Water getting into your pop up camper means you may have a problem with mold. You’ll need to air out and dry our camper frequently to avoid issues with moisture and condensation. Pop up campers are basically meant for campgrounds, with some of them good for boondocking down dirt roads. However, you won’t be able to pull over and sleep for the night in rest stops or WalMarts, which many RVers enjoy doing. 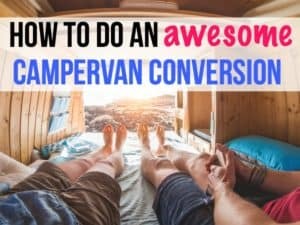 If you’re camping every single weekend or going on extended RVing roadtrips, you might get sick of taking down and putting up your pop up camper. With a hard-sided travel trailer or RV, there is no setup required. You just park and you’re ready to go. Given that pop up campers are basically glorified tents, you don’t have as much privacy as you would with a traditional RV. Even someone in the next campsite over can see you moving around behind those canvas walls. Given that the toilet area doesn’t have it’s own separate room with a door, this can get awkward. It’s known that the beds in pop up campers are not very comfortable. Most people bring along extra padding to go onto their camper beds. If you’re looking for a luxury mattress, you’ll probably want to consider an RV or even a campervan. There’s a lot to consider before you purchase your very first pop up camper. Here are a few factors you should think about before heading to the dealer lot. Do you need a toilet? Not every single pop up camper comes with a toilet. If having a bathroom in your camper is super important to you, you’ll want to look for a camping trailer with a toilet. Keep in mind a toilet doesn’t get its own separate room. It’s usually divided from the rest of the camper with a curtain. How many people will you want to sleep? Think about how many people you’ll want to sleep inside your camper. Many of them can sleep six people easily. If you’re sleeping fewer people, you might want a smaller camper trailer. What amenities will you need? Do you need WiFi when you’re camping? What about hot water? Do you feel uncomfortable without air conditioning? Pop up campers come with different amenities depending on the make and model. 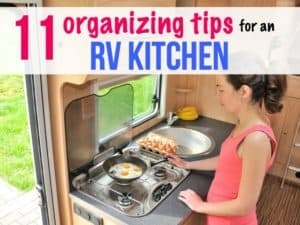 Write a list of the amenities you’ll need in a camper so you’re prepared when you head to the RV lot. Do you want to take your camper off-roading? If your dream is to get far from people and go boondocking, you’ll want a pop up camper with off-road capabilities. 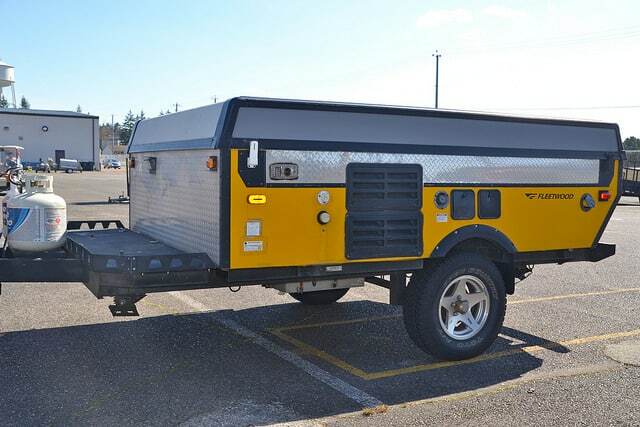 Some campers come with an off-road package that includes better tires and steel wheels so the rig can take a beating. How often are you planning on camping? If you’re going on months-long road trips, a pop-up camper might not be right for you. 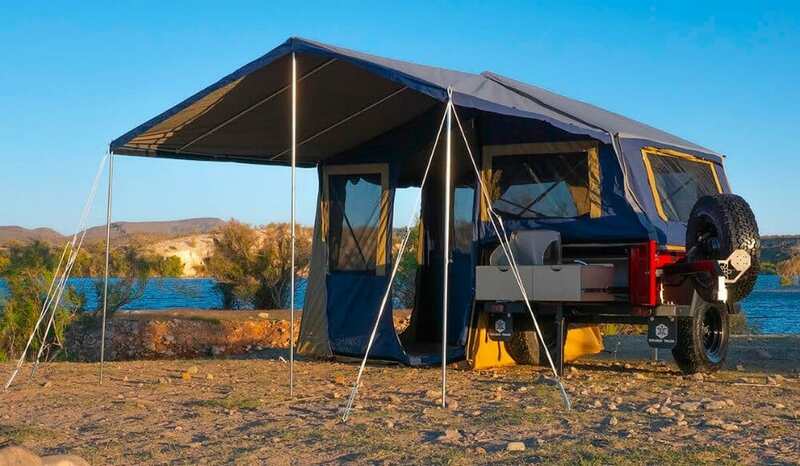 Pop up campers are designed for shorter term usage and don’t have the durability of hard-sided travel trailers and RVs. If you’re doing weekend camping trips, a pop up camper could be just what you need! 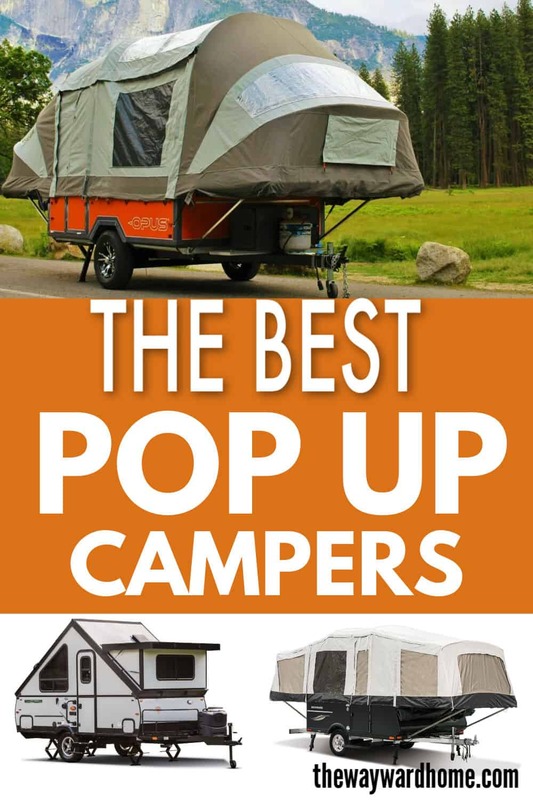 If you’ve decided you want a pop up camper, there are many to pick from right now. Have a hard time making a decision? 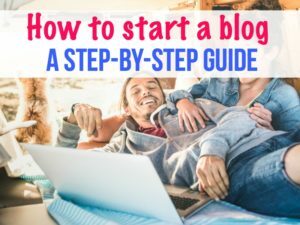 One thing you can do is to rent one before you buy to make sure your family likes the setup. There are plenty of pop up campers on the RV rental site Outdoorsy. Just enter the coupon code “wayward40” when you checkout to get $40 off your rental! Here are the best pop up campers we’ve found. 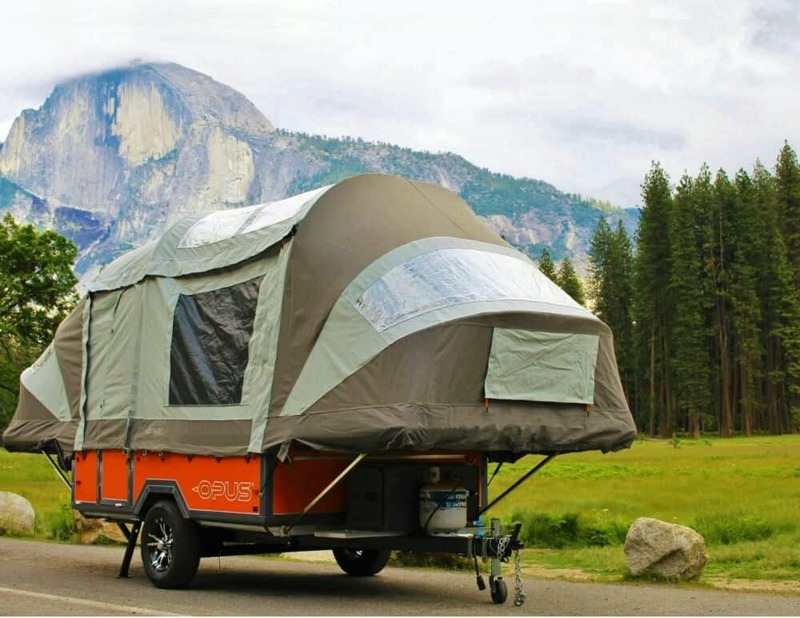 The Air Opus is a cutting-edge pop up camper as it’s gotten rid of the telescoping poles and cranking system most pop ups use. Instead, using Air Pole Technology, all you have to do is flip a switch and your camper pops up in 90 seconds. It deflates in 30 seconds, so it’s even easier for you to pack up and get out when you’re camping trip is over. The Opus’ light weight means it’s towable by most 6-cylinder SUVs. Want to go off-roading? You can get the Air Opus in an off-road edition, which is ruggedly made to reach those off-grid destinations. 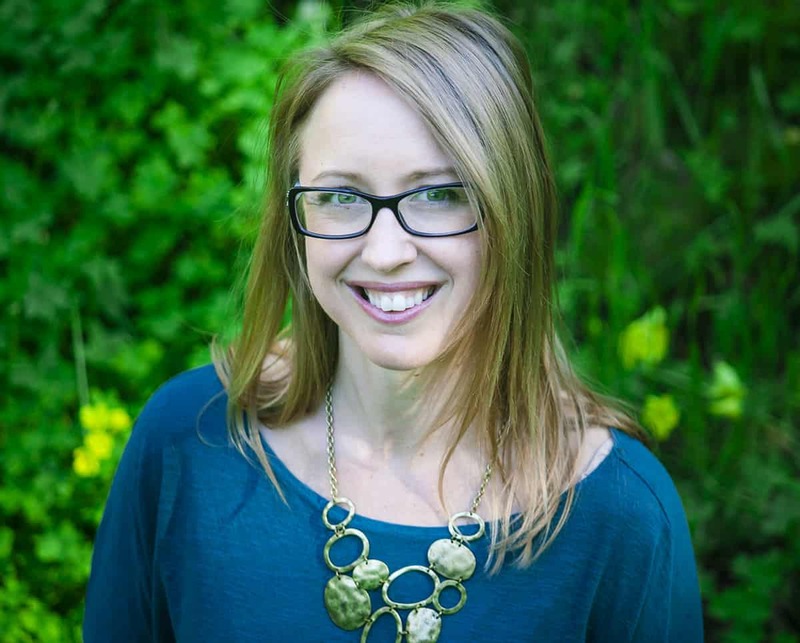 Learn more about the Air Opus here. 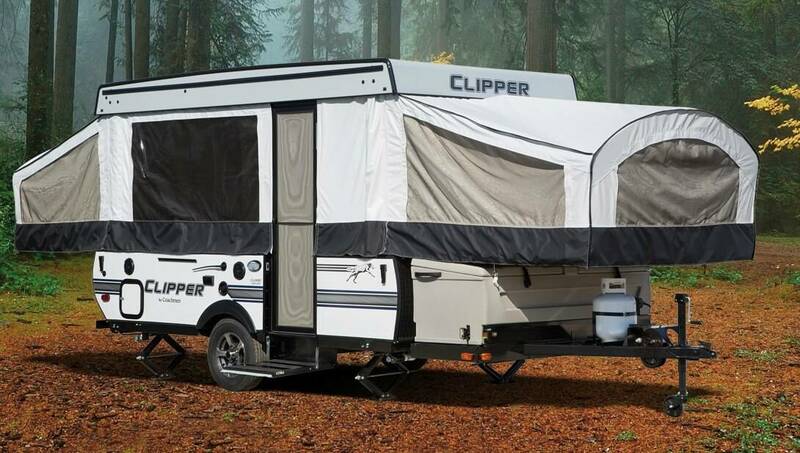 Coachman makes four different styles of Clipper camping trailer: the Express, the LS, the Sport/Classic and the V-Trek. Then, all those models come in a variety of sizes! With all the models, you’ll raise the roof using a dual drive winch and drill bit, with a crank handle for backup. Coachman says this camper pops up in just 30 seconds. Coachman Clipper pop up trailers will have any amenity you’re looking for. Do you absolutely need a toilet and a shower? You’ll find that in the Classic and the V-Trek. Want something small and portable? Check out the Express. When it comes to all the options with Coachman, it’s probably best to head to a dealer and tour the camper trailers yourself. Learn more about Coachman Clipper campers here. We love this pop up camper because it’s the best of both worlds. Not only does it have the portability and storability of a pop-up camper, it also has the hard sides of a typical travel trailer. Yes, this amazing little A-frame camper does condense down into a sleek, towable camper. This hard-sided camper is made out of fiberglass and is quick and easy to set up. Don’t like the A-frame? Forest River has other Rockwood varieties, including one that looks more like a typical pop up camper. To boot, you can get any Rockwood camper with the “Extreme Sports Package,” which is designed for active couples and families. The ESP comes with mount cross bars that can store outdoor gear like bicycles and kayaks, and more tech than their pop-up counterparts, such as the WiFi Ranger. 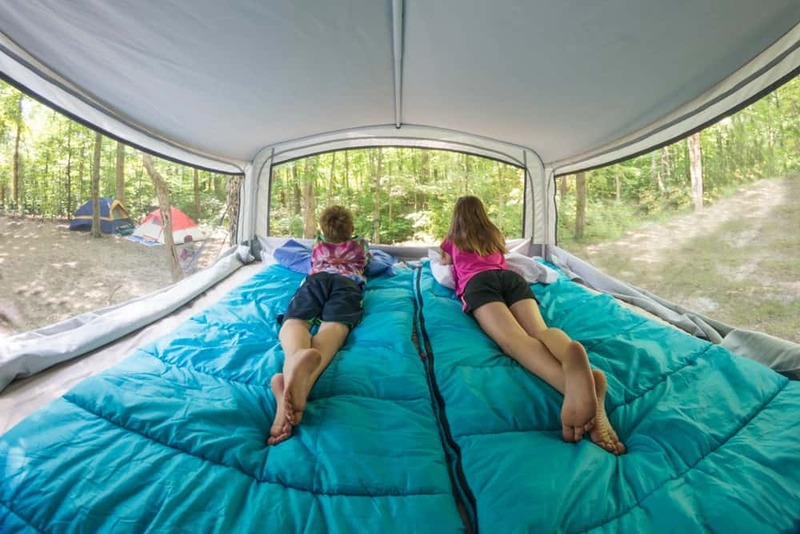 Head here to learn more about the Rockwood hard-sided pop up camper. These pop up campers by Livin Lite are meant to be hardy and very lightweight. Their aluminum cabinetry, tubular aluminum frame and composite countertops all contribute to their extremely light design. You won’t get tons of bells and whistles with this pop up camper, but you can choose your exterior color and from four different floorplans. Unlike most pop up campers, the Quicksilver camper does not have a hard roof. Instead, the entire thing is made from canvas and folds together to create a watertight seal for storage. One benefit of a soft roof is you don’t have to deal with winches and cranks to set up this pop up camper. This is a great budget camper that can be easily towed, stored and set up. 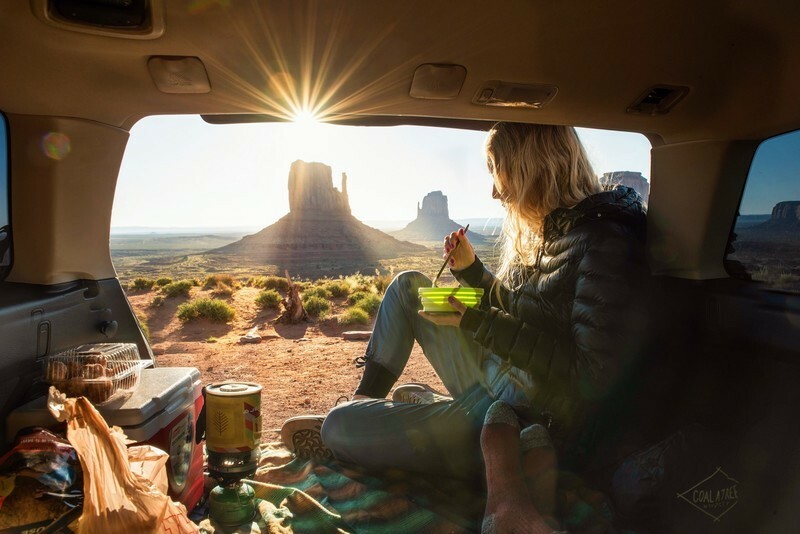 Learn more about the Livin Lite Quicksilver pop up camper. The Aliner Somerset pop up campers come in several different varieties – the Grand Tour Ultra Light, Grand Tour and Evolution, offering five different models. Grand Tour Series pop up campers come with two king-sized beds in the pull-out slides. All the campers have a no-spill, swing-level galley which allows for super easy setup. The Somerset camping trailer is the only folding trailer made with a 6-inch tubular steel frame construction and Posi-Lock™ lift system, which all makes setup a breeze. Need something more rugged? You can check out the Evolution series, meant to withstand off-road adventures with its 15-inch off-road tires and alloy rims. Learn more about the Somerset Camping Trailers. This lightweight camper trailer is an adventuremobile in a tiny package. 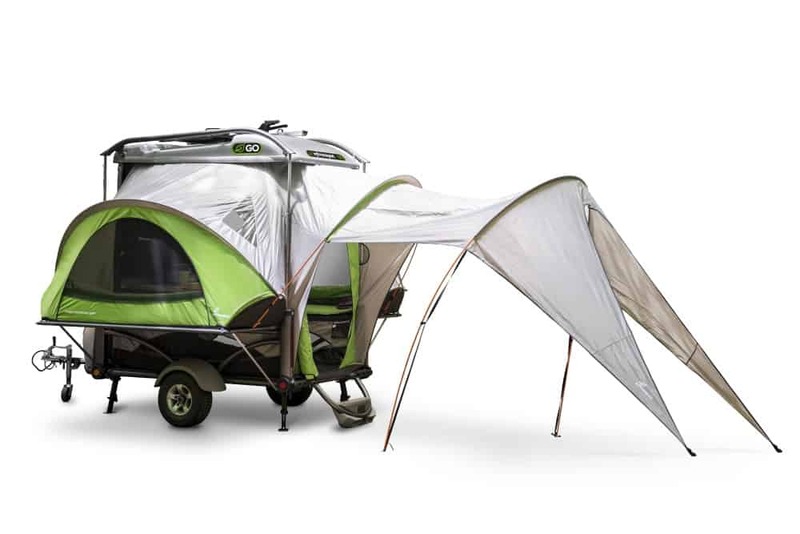 When it’s folded down, this pop up camper can carry up to a dozen bikes or kayaks, and even motorcycles and ATVs! Plus, there’s a lockable, waterproof storage box with 9-cubic feet of space that doubles as a cooler. 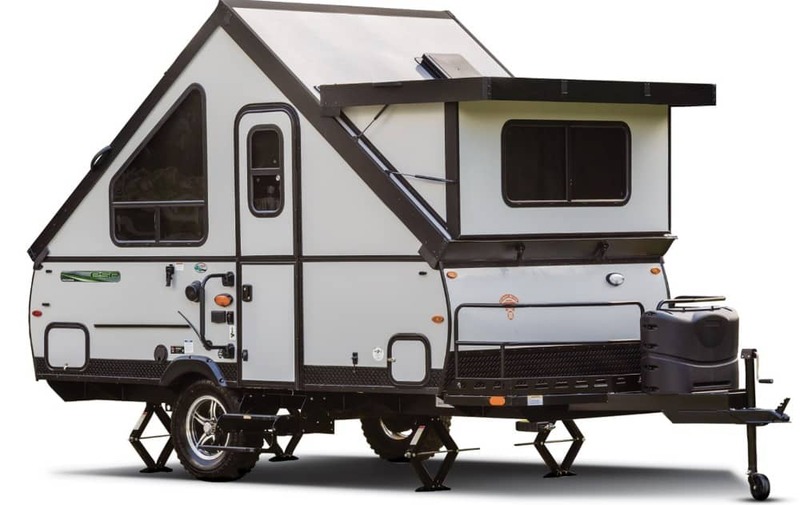 This amazing little camper can be towed by almost any car and you won’t see a huge ding to your gas mileage. The tent camper is also a breeze to set up, with a spacious, elevated, self-inflating waterproof tent. The GO gets you closer to nature than other pop up campers. When fully inflated, it has 6’5″ of ceiling height, oversized windows and screens and multiple sleeping and dining arrangements. A fold-out awning gives you outdoor living space, too. When you’re not camping, you can even turn this pop up camper into a utility trailer or a gear hauler. Talk about a versatile little rig. Learn more about the Sylvansport Pop Up Camper. This is the tiniest pop up camper trailer we could find, and it’s perfect for the adventurer who loves going to remote spots. This pop up camper comes with an easy-to-deploy tent with a queen sized mattress, tent-side storage and 200-square feet of living space. It can sleep six people and any SUV can tow it. This little pop up camper can go anywhere you want to take it with its steel wheels and off-road tires. You can even camp in the cold as the tent walls and roof are insulated. There are plenty of upgrades you can add onto this camper, including solar, inverter, a deep sink and refrigerators. Learn more about The Adventure Trail here. Pop up campers are a great way to upgrade from a tent without buying an expensive travel trailer or RV. Travel trailer campers are easy to set up and can be towed with mid-sized vehicles like an SUV or a minivan. The sides of a pop up camper are made of canvas or vinyl, so you’ll feel more like you’re out in nature than with a hard-sided RV. Popup campers are the most affordable RV out there. If you want to buy a used pop up camper, you could get one for as cheap as $1,000. These campers aren’t rugged and durable enough to be used for full-time use, and some people report problems with leakage. If you want to live in your camper, you’re better off with a travel trailer, fifth wheels, RV or campervan.